The best way to use Twitter on the Galaxy Tab is to already have a Twitter account. After you’ve established a Twitter account, obtain the Twitter app for your Galaxy Tab. The app can be obtained from the Android Market. When you start the Twitter app for the first time, touch the Sign In button. Type your Twitter username or e-mail address and then type your Twitter password. After that, you can use Twitter without having to log in again — until you turn off the Tab or exit the Twitter app. To read tweets, choose the Timeline. Recent tweets are displayed in a list, with the most recent information at the top. Scroll the list by swiping it with your finger. To tweet, touch the New Tweet icon. 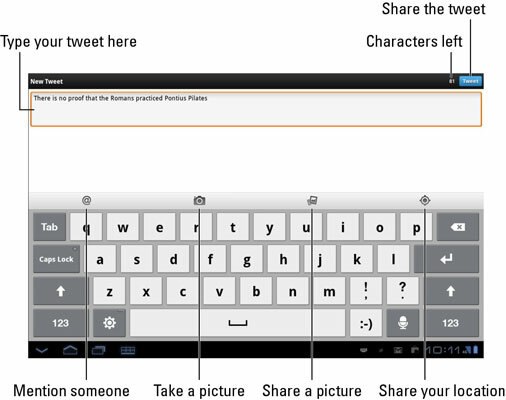 Use the New Tweet screen to compose your tweet. You have only 140 characters for creating your tweet. That includes spaces. 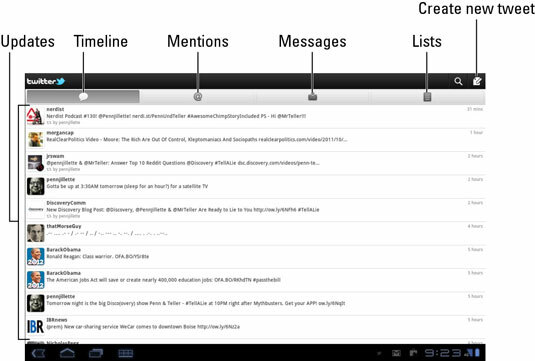 The Twitter app appears on various Share menus in other apps on your Galaxy Tab. You use those Share menus to send to Twitter whatever you’re looking at.